New information, published in the Journal of Raptor Research, suggests that Peregrines may be using city lights to hunt and feed their young at night. 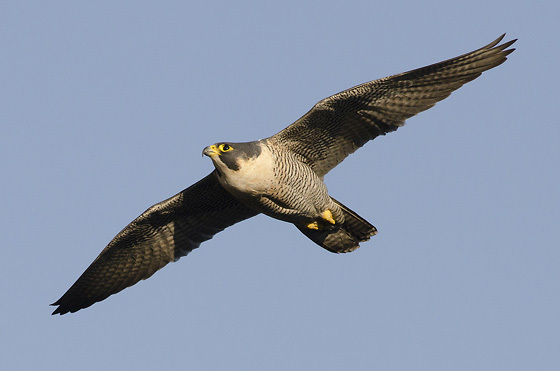 A team at Nottingham Trent University observed adult Peregrines bringing food back to the nest for chicks on several occasions late at night at urban sites. The team studied Nottingham Trent University’s resident pair — which have nested on a ledge of the university’s Newton Building in the city centre for over ten years — as well as two other nest sites in the UK. Using webcams to view their movements between 22:00 and 04:00, the team observed the birds at the Nottingham site returning with food on four separate occasions, including three times during one night. The adults returned with small to medium-sized birds —?and on one occasion what was believed to be a bat. 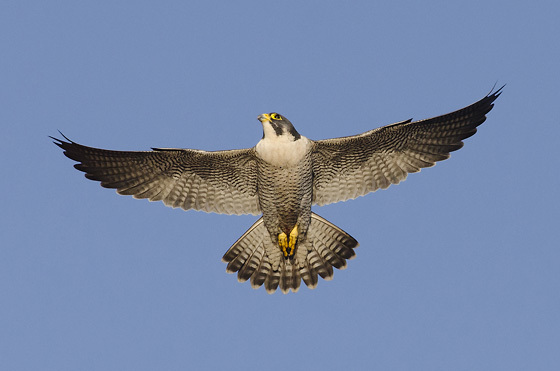 While Peregrines typically nest on cliff edges and in open landscapes, they have started nesting on tall buildings in towns and cities, which mimic these conditions, as their population has recovered. 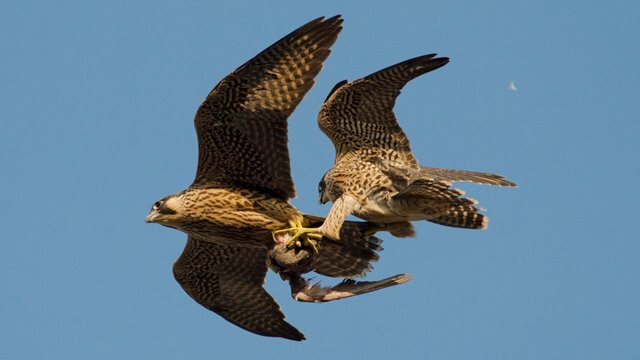 Having a far greater abundance of prey than their rural counterparts could be another reason for this newly-emerging habit among urban-dwelling Peregrines, the researchers suggest. The latest work forms part of a wider study at the university investigating what impact nesting in urban areas is having on the species. Esther Kettel, a researcher at the university’s School of Animal, Rural and Environmental Sciences, commented: “Peregrines are considered daytime raptors, but urban environments are providing them with nocturnal hunting opportunities. It is very possible that these birds are taking advantage of street lights and maximising hunting opportunities where there is plenty of prey. Our study suggests that night-time feeding could be more widespread than previously known. “We want to be able to ascertain whether the birds are hunting the food at night, or bringing it in from a nearby ‘larder’ where they have stored earlier kills. It is known that rural Peregrines will store food for later, but this is particularly during the winter and when food is scarce. In addition to the research undertaken by a team at Nottingham Trent University, scientists in Prague have also found that the 3 resident pairs of peregrines breeding inside the city regularly hunt at night using the bright lights of the capital to catch their prey. The installation of a thermal imaging camera at NTU, to cover this past breeding season was intended to monitor the number of fresh / blood hot prey items delivered to the eyrie throughout the breeding season. This report does not mention the success of monitoring this year. The caching of prey is primarily associated with the rearing stage of the breeding cycle. I found the thermal imaging of more interest when observing the heat loss of downy eyasses which decreased as their plumage replaced the down. I had assumed that their down acted like a duvet trapping body heat. Catching prey during the hours of darkness does depend on the prey also being prompted to be abroad too – the majority are migratory species I understand and are taken from beneath while silhouetted by the city lights.